"Yummy Italian marzipan cookies flavored with lemon zest and rolled in sugar. Traditional gluten-free Christmas treats, great to serve year around." Combine ground almonds, 2 1/2 cups sugar, eggs, lemon zest, and vanilla extract in a bowl; mix into a smooth dough. Preheat oven to 400 degrees F (200 degrees C). Line a baking sheet with parchment paper. Pour 1/4 cup sugar onto a shallow plate. Roll dough into walnut-size balls and roll in sugar. Place 2 inches apart on the baking sheet. Bake in the preheated oven until lightly browned, 10 to 15 minutes. Remove from oven and transfer carefully to a wire rack. Cool completely before serving. You can also grease the baking sheet with butter and dust with flour instead of lining it with parchment paper. 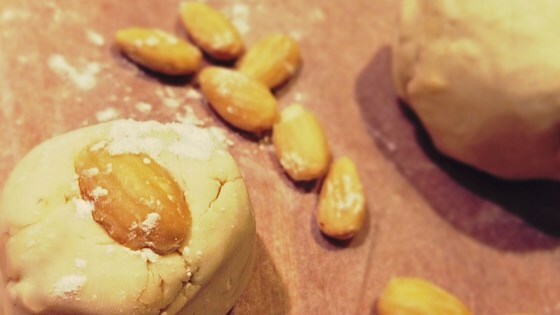 If you like, you can decorate the cookies with half an almond.